So many miscellaneous projects going on over here, that I thought I'd make a post dedicated to them. So let's start with this hutch project. 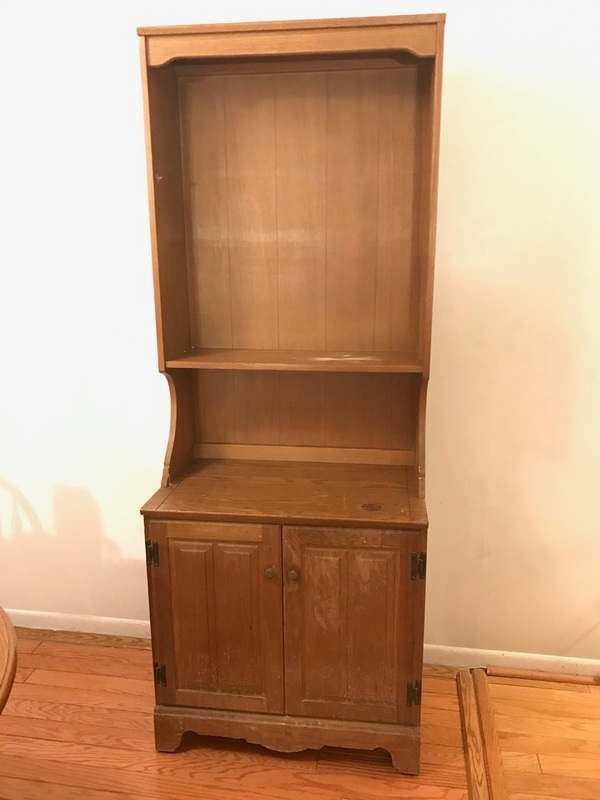 A friend of ours asked us if we wanted this cabinet/hutch for free! So we took it. The space I originally intended to put it just didn't work out, so I listed it on Facebook Marketplace and Craigslist for $30. No interest. At all. I was pretty surprised. Ehhh... maybe not. Here's what it looked like before. Lots of nicks and scratches and dings. Otherwise, it was a sturdy wooden piece! I ended up using the cheapo Michael's chalk paint in white. I did two coats with one of their large jars that I got at 50% off. Some stains still came through and there are some "sparse" areas, but since I wanted to go for a distressed look, I figured all the "sparse" areas would work for me. Plus, I'm lazy. Then I sanded down the corners and edges with a light grit sandpaper, followed by two coats of satin polyacrylic. And, ta-da! Here's another before and after shot, side by side. I just used the existing hinges and knobs as they were. One door keeps getting stuck, but we only store board games in the bottom, so it's not like we need to open and close the cabinet daily. Not bad for a freebie! Then THIS listing came up on Facebook Marketplace. Trolling pays off people. I was first in line!!! For less than 300 bucks?! Let's do it! I sold our existing couch and chair and a half for $250 (or something close to that) the same day I listed it. Face it, that couch and sofa were just too big and clunky for our living room! And yay for awesome friends who help an awesome husband pick up and carry awesome furniture for you! And did I mention that the couch is in fabulous condition? And that the slipcovers come off to wash?! A dream people. A dream. 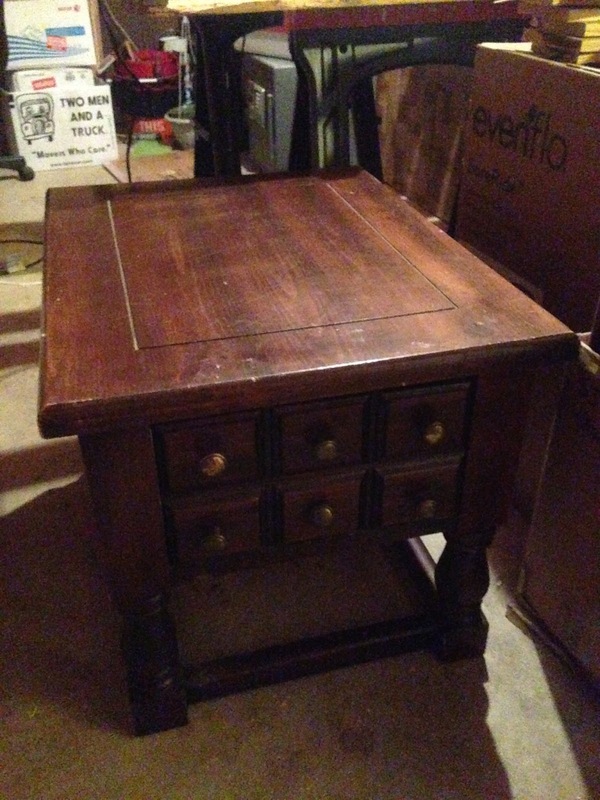 The next project I wanted to share is this side table that I picked up several months ago for $10(???). It's a very sturdy, wooden table. I sanded it and then used white paint I already had and whitewashed it. I just watered the paint down to thin it out, spread it on the table, let it sit for a minute or two, and then wiped it off in the direction of the woodgrain with some clean paper towels. I did a few coats/layers of this until I got the coverage I wanted. Then I sanded the corners/edges a bit and put the existing hardware back on. Unfortunately, with our newly painted hutch/cabinet and couch, there is no room for this little furniture baby. Up for sale it goes! The last project I wanted to share was this sign I painted for a friend's baby shower gift. To end this post, I'd like to share my latest Influenster Voxbox with y'all. (Sorry if this post is somewhat all over the place; I've been very scattered lately.) I somehow qualified for a gluten free box. Hm... Not sure how that happened because I am most definitely not gluten free. I love gluten. Love it. The box included several coupons for the perishable foods, and I was able to get everything except for one item. I still have a few more stores to check for it. Here are my thoughts on the Udis muffins: The flavor of the muffins are tasty and I enjoyed the crunch from the sugar topping. Howeverrrr, the thing that gave away the fact that these are not normal muffins was the weird spongey texture. And my thoughts on the evol mac and cheese: Extremely small portion size and the truffle flavor was not very pleasant. Not a fan. What projects have you been up to? 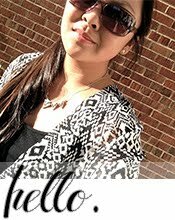 Leave a link because I would love to stop by and check it out! What wonderful transformations. The hutch and table are incredible. you really managed to make the detail pop so much better then the original finish. Congratulations on the sofa sectional. It is beautiful. Wow! That cabinet looks so different! It's so charming and farm style now. Perfect for that Pottery Barn look! You've been busy! I'm not a fan of the gluten free stuff. It always leaves this weird feel in your mouth. I am not sure why you can't find the corrugated stuff. Last time I bought it at Michael's. It was the brown one. I'm not sure I've seen the white one around. It's an item in high demand! LOL! Give a kiss to Princess Selah for me. Yaaaaaas loved that gift! AND I had been meaning to tell you since I first saw it, the hutch is super cute! I love how coordinated your living room is.